One of my greatest and most enduring “enthusiams” over the past twenty years has been collecting Portuguese vintage ports. It began when my dad gave me a bottle of 1966 Warre’s that a client had gifted him, and was further spurred on by my long online friendship with the wonderful Roy Hersh – now one of the world’s most renowned port experts. Portuguese vintage port comes with a glorious history (you know how much I love a back-story). The constant fighting between the French and the British during the seventeenth century meant that the supply of French wines to England dried up, and British wine merchants were forced to seek alternative sources. They found suppliers in Portugal, but the table wines didn’t survive the long journey back to England. In order to “fortify” them for shipping, brandy was added, resulting in the “fortified” wine we know of today as “port” (named after the city of Porto). Collecting Portuguese vintage port in Sydney is a tricky business – we’re about as far away from Portugal as one can get and still be on the same planet. In Australia, our fortified wines from the Rutherglen in Victoria are unique and superb – the region produces muscats and tokays which are world class, as well as some decent tawny ports. But Portuguese VPs are a completely different wine – whereas Australian fortifieds are viscous, sweet and occasionally complex, vintage ports from Portugal are elegant, rich and fruit driven. If you’re interested in tasting a Portuguese port, a good place to start is with a late bottled vintage one. An LBV (as the style is known) differs slightly from a true VP in that it’s kept in wood for four to seven years instead of two, which accelerates the development of the wine. As a result, the port is ready to drink on release, rather than needing a twenty year sleep in a dark cellar first. And unlike traditional vintage ports, filtered LBVs don’t require decanting and breathing prior to serving. What’s your favourite tipple? Are you a fan of fortified wines? I’d love to know what you love to drink! How interesting Celia and what a great enthusiasm to have! I am not really into fortified wines but a few years ago a lovely friend gave me a bottle of Pedro Ximenez sherry and although I treat it with caution it is the most glorious mouthful of liquid fruit cake. Oh…and splashed over vanilla ice cream it is pure heaven. Most welcome! Isn’t it fascinating – I love knowing how things evolved! on September 11, 2014 at 7:03 pm Platanos, Mangoes and Me! I remember coming home from Portugal many years ago bringing back 4 bottles of dusty and dirty bottles of Porto..gifting one to my former boss who almost fell of his chair after seeing the bottle. I made a great impression. Little did I know that I had brought back a treasure. That is when I learned about Porto. I’m hoping i will be able to find your in the states. Will let you know. I also enjoy cooking with it. Woohoo…you must have come home with a doozy, Norma! Some astonishing old ports to be had, but they can be hard to find! I noticed you added some to the gravy pan for your roast, sounds good. Many, many years ago I used to buy my port in 10 ltr lots from Brown Brothers. Stopped when my husband (then just a nice bloke) kept leaving the tap open and it ended up over the floor. I also had a friend comment when camping, on how I always threw the cork into the fire when a bottle was opened. Obviously didn’t expect to reseal it! I haven’t tried port for many years now but I do soak my Christmas Pudding fruit in it. Six weeks on the bench, I wouldn’t hold out much hope for that at our place! Thanks for taking me back in time, we had a few giggles over some funny port stories. I remember the Brown Brothers port! I can’t drink Aus port anymore – it’s too viscous and sweet and a bit too woody for me now. 10ltr lots is impressive Maree – did you buy a small keg? I know very little about port other than it’s good to drink but we rarely buy it, possibly because I don’t know how to choose a good one. Obviously I need to investigate further. My tipple is Gin (but you’ve probably guessed that). Martin Miller’s gin is my favourite but we’re drinking a bottle of The Botanist that’s very good. Oh, and of course Slamseys Sloe Gin or Rose Gin. Better stop now before I sound like some gin sodden hag from Hogarth’s Gin Lane. See, I’m very fond of Rutherglen fortifieds, but NOT their ports. I wonder if they’ve had to change their signage – due to changes in international labeling, they’re no longer allowed to use the word “port”, so the Oz fortifieds are now known as “Tawnys”. Don’t talk to me about tipples Celia. I have been on the road for a week in the glorious land of tipples, that is South Australia. Mclarin Vake and Clare produce some great wines. Must try a port from Portugal. Have a wonderful time, Francesca! Glorious place to visit! The Clare and Eden valley rieslings are some of my favourites! Really enjoyed the backstory! I am not a fan of port at all…to me they taste like the love child of cold medicine and syrup. However, there have been wines I thought I disliked until I was reintroduced to them by the right person who knew what they were talking about, so maybe it will be the same way with port. I do enjoy Port. We bought some when in Lisbon a few years ago but sadly it’s all gone. Had a friend who passed on his gift of vintage Port every Xmas until one day he tried it. :-(. No more re gifting! Must pick up a bottle soon. Hahaha…hope you managed to get a few bottles before he figured out how good they were! My husband would love to get his hands on these. I must admit I do like the very occasional Port too. Ross got to try some extra special vintage Port when he was studying at Oxford University as they have their own cellars beneath the collages full of very exciting stuff as you can probably imagine. The English universities are famous for the ports in their cellars! It really is a perfect match – port and cheese! Port and chocolate…one of my favorite was to end a meal. It’s a pleasant finish, isn’t it? :) But the chocolate has to be quite dark – I don’t actually like milk chocolate with port! I totally agree with you…I’m am totally a dark chocolate girl myself. I am with Karen, port and chocolate to end a meal, yay! I do cook with port but don’t know much about it other than it is a fortified wine. Thanks for the history lesson, learned something new. I am a big fan of fortified wine, Banyuls and Maury especially. nice article! A great post, Celia… so interesting! Reminded me that when I was married (to my ex), we would often indulge in a good bottle of port and some good cheese. That’s a thing of the past, as Peter and I don’t often drink port… but it’s great to have you as a reference point, love, should we find ourselves fancying some. Sending hugs. i remember when i was a child my father used to bring portuguese wine in stone bottles back from his trips to darwin..it fascinated me and seemed so exotic then..
Jane, is there anything better than cooking with liqueurs and wines? I’d toss some into every meal if I could (and I do manage to get some into most)! on September 12, 2014 at 9:00 am Glenn E.
That’s a good looking set of bottles. The 1980 Dow is absolutely stunning… you’re lucky to have 4 of them! Thanks for stopping by Glenn! Yes, feeling very lucky to find the Dow’s – and they were all in perfect condition! Interesting :) I’ve been happily splashing Buller’s Malmsey (Madeira) into my braises, sauces etc. 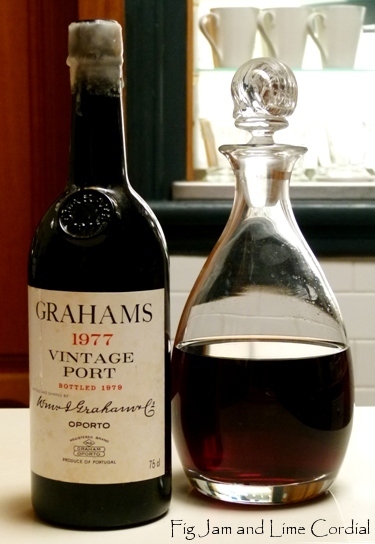 I may have to try the Graham’s Port when the bottle is empty. I enjoy a sip but they are too sweet for my tastes, but I enjoy visiting our local Taylors Arm Gruber’s Winery for a taste of their ports – they do a pink and a normal, and I find them great for gifts… my Dad is a happy recipient. Australian port is a completely different beast to the Portuguese variety – the latter isn’t quite as sweet or sticky. You might enjoy it! I’m used to Australian and NZ wines, but would love to sample your collection, too. Thanks for buying tips, Celia! Sadly most of my memories of port revolve around camp fires, flagons and headaches the next morning. A nice bottle of bubbly or a beer are my usual tipple. Hahaha…will have to remember that, Lorraine! I don’t know much about sherry, I’ll have to learn more! You have so many aspects to your food enthusiasms (and general veuve for life) Celia. Quite a lot of my fortified wines end up in cooking and the classic pairing of port and blue cheese always does it for me. The bit about getting to know Roy Hersh is fascinating. And carrying on from Twitter…. how I’d love to raise a glass with you one day. Charlie, that’s a fabulous story! Carl’s ancestors really did do so much, didn’t they! I do like your decanter in the first photo. Since I’ve stumbled my way into my sixties I find I can’t drink port – it gives me heart flutters which sounds as if it should be fun doesn’t it. Peter does like Port so I might try and find him a bottle of the Grahams’. As for me – I really do love a good ‘chewy’ Cabernet and I really like good champagne – but best of all I love a tipple shared with good companions and good food. I recently heard a glass-clinking toast which was “Here’s to love and money and time enough to enjoy both”. – I thought that was rather nice. I never knew the history of Port but I really do enjoy a nice glass of it. Unfortunately, I’m the only one who really likes it so I don’t have much. Not being a huge drinker due to migraines, I can only manage a glass every now & then. My husband & I both really enjoy a nice red wine & I only wish that we could get some of those that we tried while we were in Italy – although our suitcases did have a few stashed in them. Well, as they say everything in moderation so a little drop here and there is good.